Wondering what materials make a difference in building your models? Check out this submission from one of our customers. "I downloaded the free download of the shed and then built it two different ways. The first one was just as the designer did on cardstock. With the second one, I glued the cardstock on black chip board, then glued the walls to the front and back letting the chipboard show. It looks great, just like trim!" "I just completed my very first scratch built with the aid of Model Builder. This is the Casterline Sawmill & Lumberyard in Hillbilly Junction, TN. The sawmill workers are Prieser construction workers. I designed this in part from a photo I saw of a custom kit that cost over $400! My actual investment was about $35.00!" 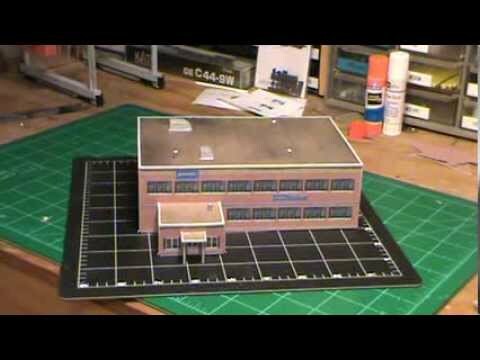 Model Builder is just as cost-effective as it is easy to use! Another view of the Casterline Sawmill & Lumberyard built using Model Builder. This model was a customer's first G-scale Model Builder building. "It was a lot of fun to build!" Scene from Shoshone Village, CA gateway to Death Valley. Adhesive paper on plastic sheet with styrene roof materials. NTRAK Module of Downtown Winslow, AZ all building designed using photos and scaled to N Scale. Printed on adhesive backed photo paper, which is applied to 0.020 thk polystyrene sheet and panels glued using 1/8 in. angle polystyrene and Tenax. corners touched up using pastel chalks. HO scale shelf layout. Runs along the ceiling of my office. Two tracks with double crossovers. Going DCC this month. My 1st attempt. I used a cardboard box and plain paper, tacky glue and real stones. The gas pump is scratch built. Plan #1090 in HO Scale using Model Builder software printed to 45 lb matte photo paper. Balsa roof underlay ans some foam board reinforcing inside structure. this great layout has a Main street featuring lots of Model builder buildings. Around 1:48 on the timeline. Three buildings I have built since Chistmas for my future train layout. Love the updates on the site. What a susprise to see all my buildings in the gallery, THANK YOU Been out of circulation for a while. Now back on my feet. Love the updates on the site. What a surprise to see all my buildings in the gallery, THANK YOU Been out of circulation for a while. Now back on my feet. Dear Shelly and Dave. Love the updates on the site. What a surprise to see all my buildings in the gallery, THANK YOU Been out of circulation for a while. Now back on my feet. Dear Shelly and Dave. Love the updates on the site. What a susprise to see all my buildings in the gallery, THANK YOU Been out of circulation for a while. Now back on my feet. My first attempt at G Scale scratch building is my interpretation of Evans City Station. The Main structure is foam board covered with printed clapboard siding. Doors and windows are printed and then lolly pop stick cut and glued were necessary. This is Plan 444 (out in April)- Grand Trunk Railway bunkhouse. HO scale using only 45 lb matte photo paper. Built with Model builder, Freight Station in 1:220 Scale. I delved into Model Builder and came up with a building with a few extra angles. This was done completely in Model Builder, and any evident mistakes are the fault of this architect. It's a bit larger than I intended, having a footprint of 11" x 9". It's made of 110 lb (199 g/m) index card, laid over black foamcore. Black foamcore is much less likely to gouge out at the edges than white foamcore. Freight Station for both Semi trucks and train Cars. Made of card stock and basswood frame. This was a "Z" scale Model I built with your program It was 4 inches long and 2 inches wide 1 1/2 inches tall. This is Plan #2062-HO, a CNR 2nd Class Depot, modeled directly after the one in Radville Saskatchewan. Exterior is done entirely in Model Builder. Walls are 64 lb. cardstock, floor and roof sub-surface are balsa, as are the hand made eave brackets and gable decorations. The lower edge of the roofing material is serrated to add realism. http://www.flickr.com/photos/jimandkarlamurray/sets/72157612285425548/ --- size photos by using a residential door as a guide. Photos add 3D effect. I am attaching a couple of photos of a few of my semi-completed models that are on the layout but require a few finishing touches. The tall office building needs a few touch ups on the corners and the roofs.The 4 story building to the left in the background of that shot was also built using Model Builder. I still have a lot of work to do on the factory, including a fire escape and some roof detailing. Model Builder is a tremendous tool. this is a picture of three C&O section houses that were at Quinnimont, WV. I added styrene corner angle to the section houses to give them a 3D look. two photos of some buildings I have made with the Evans program. three C&O section houses that were at Quinnimont, WV. I added styrene corner angle to the section houses to give them a 3D look. Just wanted to share some photos of what is the largest structure I have done. It is for a current era layout in HO scale. The foot print is 22" X 42"
and the height of the taller curtain wall is 12.9". The curtain wall structure is 10.7" X 22". The green steel wall part is 8.2"high. There are 7 rail dock doors, 2 are under the notched corner. one on the rail side are for reefers. The docks are set for 60 foot cars. Recently wife purchased your Model Builder software and a welding LED kit for my birthday. I am very pleased with both and would recommend same to anyone. Excellent job. I made with real clips/coming attractions/ads from oldtime driveins and 3 train films edited together. Again, great product. The welding kit looks wonderfully realistic as a 'projector' in the drive in." "Here is my Model Builder "Jones Farm Sheep & Goat Barn". This is another adaptation from my previous Model Builder Jones Farm Pig Pen & Chicken Coop buildings. produce stand and possibly a covered bridge. I'll send you photos once they're complete. THANKS AGAIN for Model Builder and its ease of use and design tools! The Kenzieton Hotel, 1/24th scale." "This one is modeled after a little post-war house in East Vancouver. It was a popular plan, as it was affordable to the returning WW2 vets under the Veteranï¿½s Land Act mortgage. There are still many of this style in existence in the area. We have several plans available for import into Model Builder." "I completed another building, the Ambassador Hotel in O scale. All paper with chipboard backing. Thought you would like to see it." "Thanks to your work my town and adjoining subdivision is doing well in spite of the current economic crisis. LOL Hope you enjoy a brief visit to Smalltown." "I am having a great time working with your product and now that I have figured out how to add lights it's even better. Originally I used foamboard but there was no depth when photographed. Next came the 1/4" poplar with sides wrapped around and finally this method. In the daytime the flat prints looked great but at night appeared as dark shawdows behind the other lighted buildings. 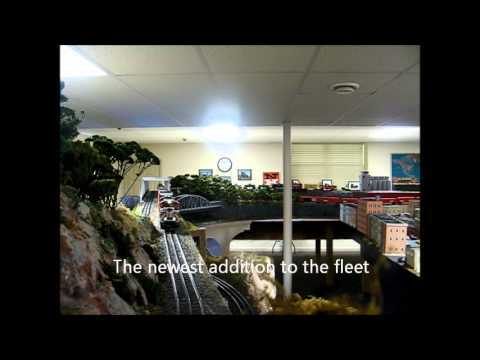 My layout is on a shelf 7" above the floor and runs two tracks around a 20' x 20' room...the "boys room" as my wife refers to it."